In order to develop your digital literacy – improving your personal learning environment; enhancing your digital identity, working more efficiently with online information, and so on – you will need to be proficient with information and communication technology (ICT). At a basic level, this means you need to be able to use ICT-based devices, apps and services via their interfaces. In terms of input, this means you need to be able to use a mouse, keyboard, touchscreen, voice control or some other mode of input where necessary. In terms of output, this means you need to be able to use a screen, microphone, haptic feedback or some other mode of output where necessary. Basic ICT proficiency also demands the ability to use Office software, a web browser and email. When using ICT it is important to be willing to learn more about technologies you might think you already understand. For example, most of us would say that we “know how to use email”. Consider the following scenario, however, which is based on an event that occurred in August 2015 and was reported by BBC News. A London sexual health centre mistakenly leaked the details of nearly 800 patients who have attended HIV clinics, bosses have admitted. The 56 Dean Street clinic in Soho sent out the names and email addresses of 780 people when a newsletter was issued to clinic patients. Patients were supposed to be blind-copied into the email but instead details were sent as a group email. As we’ve said, you should be open to learning more about a technology you might already think you know well. 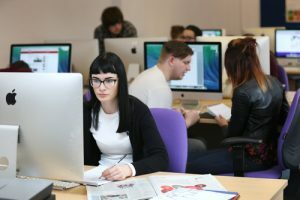 This is more important now that many services are hosted online and are updated constantly – Google Apps for instance, a service that all University of Portsmouth network accounts have access to, changes often. Don’t underestimate the value of revisiting some of the standard Office software, such as Microsoft Word: learning the more advanced features of Word, such as referencing and bibliography management, can prove to be a huge timesaver when writing your coursework. The University offers students a variety of IT training opportunities to help you develop your IT skills. You can also gain a Digital Skills Certificate by completing short Moodle modules demonstrating your digital capabilities.